(February 12, 2004) -- U.S. 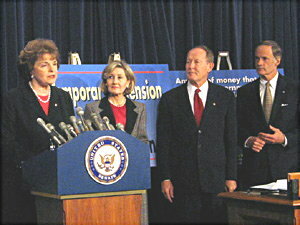 Senator Dianne Feinstein (D., CA) and three other Senators opposed to now-pending legislation that would create a permanent moratorium on internet access taxes have introduced a rival measure to ban internet access taxes for two years...while letting local governments tax telephone calls made via the internet and other telecommunications services. Sen. Feinstein's temporary internet tax moratorium would ban state and local taxes on internet access (limited to services bringing the internet into one's home or business) and DSL lines...but would let cities and counties collect taxes on telephone calls made using the internet and other telecommunications services. As previously reported by LBReport.com, groups representing city and county governments strongly oppose a measure (authored by Cong. Chris Cox (R., Newport Beach) that has already passed the House) which would create a permanent (non-expiring) internet access tax moratorium. The Senate version of the permanent tax moratorium, co-authored by Senators Ron Wyden (D., OR) and George Allen (R., VA) is now pending...and Sen. Feinstein's newly introduced legislation is a challenge to it. Senator Feinstein and others contend the Wyden-Allen bill's definition of "internet access" could be interpreted to prevent City Halls and county governments from collecting sales and utility taxes on communication services like telephone calls which are increasingly migrating to the internet. "The legislation that we introduce today would put the internet tax moratorium back in place on a two-year temporary basis, but it would do so in a way that does not cost cities and counties as much as $11.7 billion in tax revenues nationwide and $836 million in California," Senator Feinstein said in a release from her office. The release adds that her office has redeived opposition to the Wyden-Allen permanent internet tax moratorium from state and local government organizations including the National League of Cities, U.S. Conference of Mayors and League of California Cities...as well as numerous CA cities including Long Beach City Hall. ...[W]e want to assure you that we are in no way asking for your opposition to this language as a way of helping us achieve new tax revenues. We are only asking for help with protecting our city's badly needed existing tax revenues on telecommunication services, which currently represent $18.6 million annually. Mayor O'Neill's letter refers questions or requests for additional information to the League of CA Cities' Sacramento and Washington, D.C. offices. LB City Hall's federal legislative agenda, as enacted by the Council in 2003, pledged to "[s]upport legislative efforts to ensure that the City receives the maximum benefits from Internet commerce." City Hall's 2004 federal legislative agenda is now under discussion. 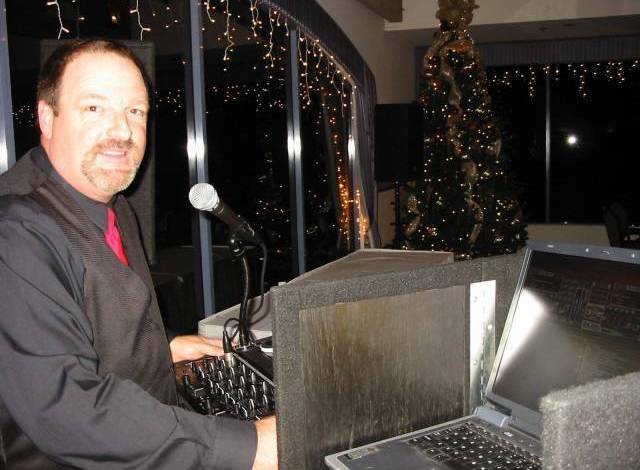 As first reported by LBReport.com, the internet tax issue arose at the February 3, 2004 LB City Council meeting when Vice Mayor Frank Colonna, chair of the Council's Federal Legislation and Environmental Affairs Committee, urged clarification of LB's formal lobbying stance on the issue. "There is a significant amount of debate regarding sales and use taxes on the internet," Vice Mayor Colonna said on Feb. 3, noting "I for one as a Councilmember do not support the adding or taxing of internet sales." However he also noted, "Now what is developing in the industry, I guess you want to call it the e-industry, there is a strong possibility, and very likely in the future, that the internet will be used for cell phone operations, and as we know in our city, we have utility users tax that is approximately 1/3 of our incoming revenues from the use tax on the use of cell phones in Long Beach. So I think we should be very cautious in watching what the financial impacts of this could do to us if, in the event, the city is precluded from collecting user's tax from the interaction of the internet." LB's currently adopted federal legislative policy is to "support legislative efforts to ensure that the city receives the maximum benefits from internet commerce" by adding the proviso "to include protecting the city from the loss of utility user's tax." The Cox-Wyden legislation bans multiple taxes and what it calls discriminatory internet taxes...something separate from the issue of sales taxes on e-commerce. The moratorium would prevent taxes on Internet access, multiple-state taxation of a single item bought online, and taxes that treat Internet purchases differently than other types of sales (in which states and localities would require internet businesses to, in effect, act as tax collectors for distant governments). The issue of whether local and state governments should be able to tax internet sales is a separate big ticket item pitting the increasing number of internet consumers and internet-based businesses (who say exempting web transactions benefits consumers and encourages innovation and growth) against state and local governments (who say exempting internet transactions costs them money) and some traditional business interests who feel disadvantaged (at losing sales). Internet advocates, noting the resourcefulness of government at finding ways to impose taxes, fear that state and local internet taxes could stifle innovation and growth of the fledgling medium. During the discussion, Councilmember Bonnie Lowenthal favored discussion of the internet issue, noting it had become a major discussion item within the National League of Cities. Councilman Dan Baker, chair of the Council's state legislation committee, noted that the Council had recently voted for a state legislative agenda which supported state efforts to ensure local taxing authority of products bought on the internet...and proposed discussing the inconsistency in a joint meeting of the Council's state and federal legislation committees. Vice Mayor Colonna agreed and so moved. The motion carried 9-0. Meanwhile, in Sacramento the newly named chair of the CA Assembly's Revenue and Taxation Committee, Ed Chavez (D., San Gabriel Valley) introduced AB 1791 on January 29, 2004 to reinstate CA's Internet Tax Freedom Act which expired January 1, 2004. In a written release, Assemblyman Chavez's office notes that local governments "have recently begun a vigorous lobbying effort to ensure that Congress does not extend the federal ban, leaving Californians to rely only on the State Legislature for protection." Assemblyman Chavez said in the release, "It is imperative that we send a strong message to the high-tech and telecommunications industries that California will not use the tax code to discriminate against them," adding "California must take action to ensure the health of our business climate, and extending the ITFA is just one necessary step." A quick check of the League of CA Cities indicates they are already opposed to Assemblyman Chavez's legislation. The bottom line: the cutting-edge policy dispute now taking place in Washington and Sacramento will soon play out in LB in a publicly agendized joint session of the City Council's state and federal legislation committees...which will consider the issue and refer a suggested policy back to the full Council for adoption. Reuters: Senators Push Two-Year Internet Tax Ban.